Calling out to all freshmen! 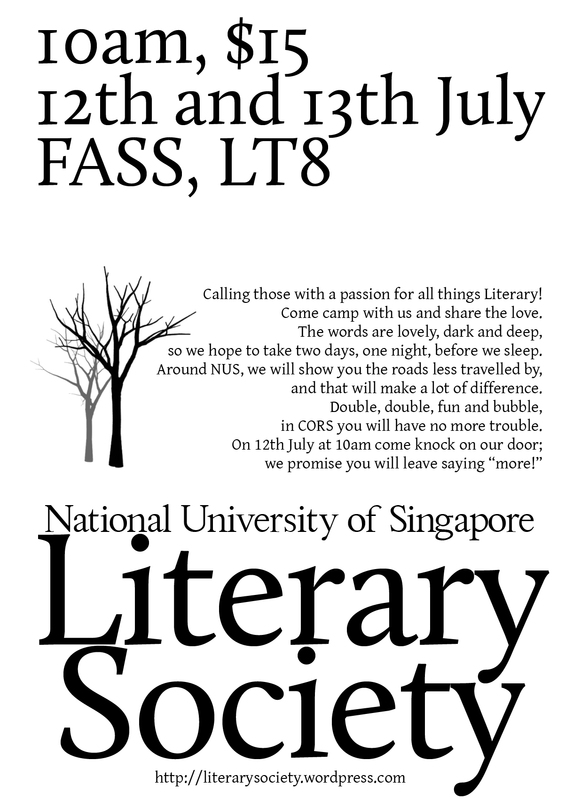 The NUS Literary Society is holding a 2 Days 1 Night freshmen orientation camp on 12 July 2011. Okay, this post is where we list out more details for our English Language and Literature Freshment Orientation Camp 2011. Phew, that’s a mouthful! We are still in the process of finalising our plans, so things may change (but probably not by much). – We welcome everyone, regardless of faculty, as long as you’re a freshman and you have an interest in Literature/Linguistics/Theatre Studies. We’d have a nice mixture of literary stuff and fun camp stuff! – The $15 fee includes an ELL T-Shirt. – Meals are not included, but we’ll be eating in the NUS canteens so it shouldn’t cost too much. – There is a one-night sleepover in NUS (tentative venue is LT8). Bring your sleeping bags! – There will be a CORS presentation by seniors, including which modules to take and which not to take. NUS has a modular system where you bid for the courses that you take every semester. Don’t worry, we’ll explain everything. – NUS is built on a ridge which gives it the nickname of National University of Stairs. Thus, knowing shortcuts will make your life a lot easier. We’d have a guided tour of how to criss-cross the campus in the least exhausting way possible! – Board games, card games, you won’t be bored! – More details will be made known as we finalise our itinerary. Presenting…the winners of CWC 2015!